Read-only: The file cannot be accidentally edited and saved. Hidden: The file cannot be seen in Windows Explorer. System: The file is a system file and should not be manipulated by the user. File is ready for archiving: This was originally used to indicate that the file is available to be backed up. This attribute is no longer used in the majority of today’s backup programs. Allow this file to have contents indexed in addition to file properties: This tells the system that when it indexes the file, it should also index the contents of the file. 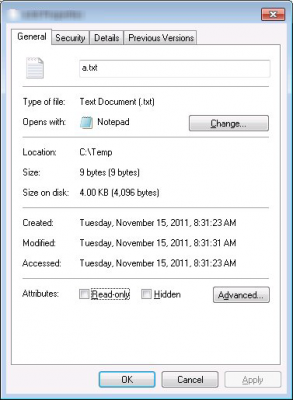 Indexing the contents of a file allows you to use the Search feature of Windows Explorer to find files that contain the specified text. If the contents are not indexed, the Search feature will only find files by their name. Compress contents to save disk space: This tells the system to compress the file in order to save disk space. 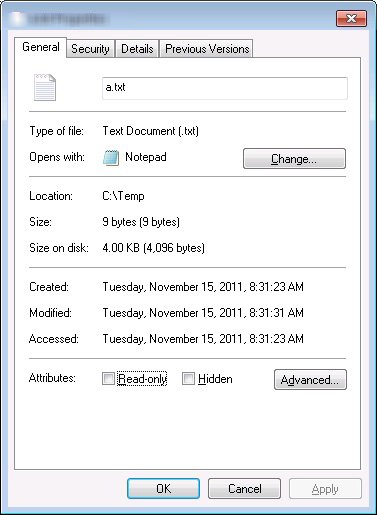 A file that is compressed is shown in blue. 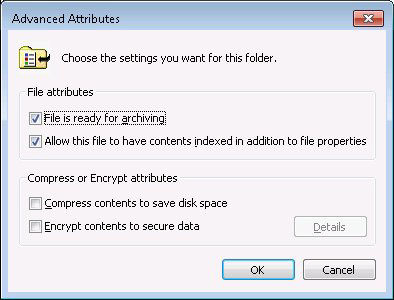 Encrypt contents to secure data: This causes the file to be encrypted, assuming the system has a properly configured recovery policy. There are a couple of ways to view and change a file’s attributes. One way is through Windows Explorer. By right-clicking on a file and selecting Properties, Windows will display a Properties dialog box for the file. In the Properties dialog box you can set the Read-only and Hidden attributes. There are more attributes and these can be seen by clicking the Advanced button to display the Advanced Attributes dialog box. Again, setting or clearing these check boxes is how you set or clear the attributes of your file.